Tranquil Tabgha, on the north-western shore of the Sea of Galilee, is best known for Christ’s miraculous multiplication of loaves and fish to feed a multitude. But it is also remembered for Jesus’ third appearance to his disciples after his Resurrection, when he tested and commissioned St Peter as leader of his Church. 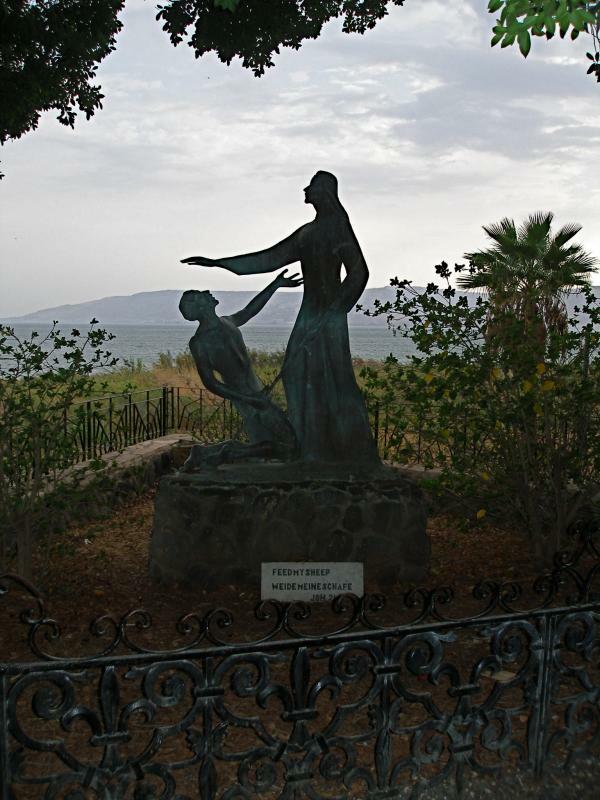 Tabgha is at the foot of the Mount of Beatitudes, about 3km south-west of Capernaum. The name is an Arab mispronunciation of the Greek Heptapegon (meaning “seven springs”). Several warm sulphurous springs enter the lake here, attracting fish especially in winter. This was a favourite spot for fishermen from nearby Capernaum, and its beach was familiar to Jesus and his disciples. It is easy to imagine Jesus speaking from a boat in one of the little bays, with crowds sitting around on the shore. According to chapter 14 of Matthew’s Gospel, the miraculous feeding came after Jesus learnt that Herod Antipas had beheaded his cousin, John the Baptist. Jesus “withdrew in a boat . . . to a deserted place by himself”. Crowds followed and he had compassion on them, curing their sick. In the evening he told the multitude — 5000 men, plus women and children — to sit on the grass. Then he took five loaves and two fish, “looked up to heaven, and blessed and broke the loaves . . . and the disciples gave them to the crowds”. After they had eaten, the leftovers filled 12 baskets. The modern Church of the Multiplication of the Loaves and Fishes at Tabgha stands on the site of a 4th-century church, displaying Byzantine mosaic decorations that are among the most elegantly executed in the Holy Land. The whole floor depicts flora and fauna of the area in vibrant colours — peacocks, cranes, cormorants, herons, doves, geese, ducks, a flamingo and a swan, as well as snakes, lotus flowers and oleanders. But the best-known mosaic, on the floor near the altar, refers to the miracle the church commemorates. 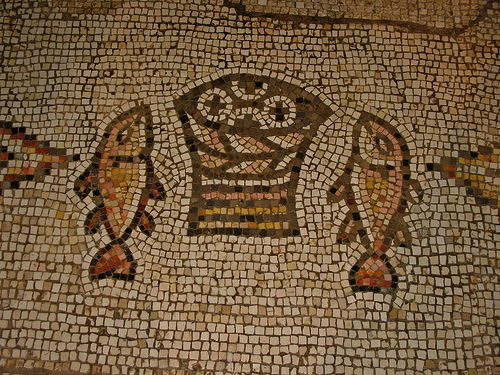 It shows a basket of loaves flanked by two Galilee mullet. Beneath the altar is the rock on which it is believed Jesus placed the loaves and fish when he blessed them. In June 2015 fire destroyed much of the Benedictine monastery attached to the church. Two youths from Jewish settler outposts were charged with arson. Nearby, on the Tabgha beach, stands the Church of the Primacy of St Peter. 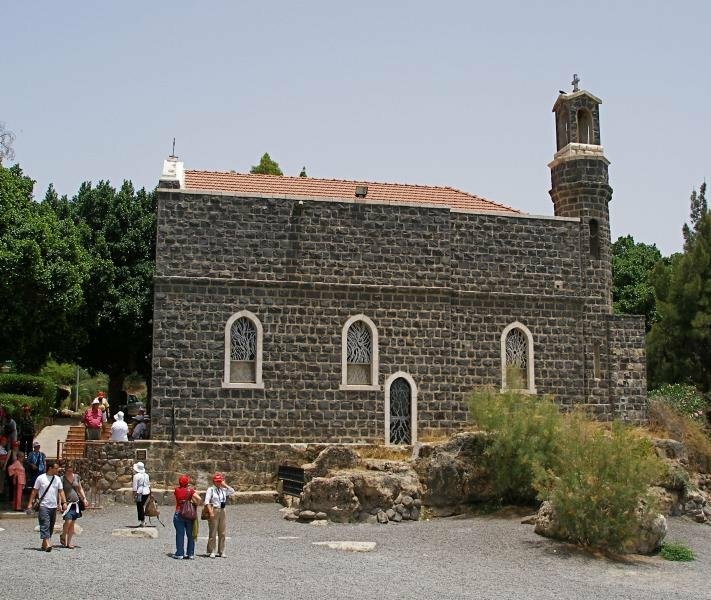 This squat building of black basalt, built in 1934, is where Jesus is believed to have made his third appearance to his disciples after his Resurrection. As the event is described in the 21st chapter of St John, Peter and six other disciples had been fishing all night without catching anything. Just after daybreak Jesus stood on the beach, though they did not recognise him. Jesus told the disciples to cast their net on the right side of the boat and the net filled with 153 fish. When the disciples dragged the net ashore, they found that Jesus had cooked them breakfast on a charcoal fire. The rock incorporated in the church floor is traditionally believed to be the place where Jesus prepared breakfast. It was known to medieval pilgrims as Mensa Christ (the table of Christ). After breakfast, Jesus challenged Peter three times with the question: “Do you love me?” Peter’s positive response to this three-fold challenge cancelled out his three-fold denial of Jesus the night before his crucifixion. Then Jesus gave Peter a three-fold commission: “Feed my lambs . . . . Tend my sheep . . . Feed my sheep.” And he also indicated that Peter would die by martyrdom. After this event Peter’s primacy as head of the apostles was recognised. Beside the church, in a garden setting, is an area designed for group worship. Between this and the lake stands a modern bronze statue of Jesus symbolically commissioning Peter with his shepherd’s crook.